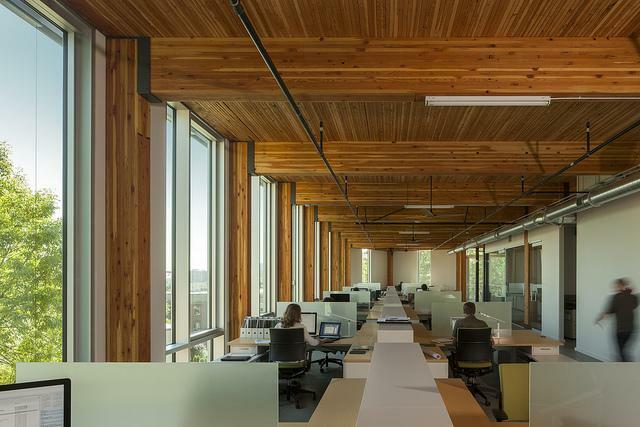 The stylishly sustainable Bullitt Center, a commercial building in Seattle, has been named the most ‘Sustainable Building of the Year’ by World Architecture News. The building – built by organizer of the first Earth Day and Earth Day Network board chair Denis Hayes – enjoyed its ribbon-cutting ceremony on Earth Day 2013. The Bullitt Center features a wide variety of sustainable innovations, including a grey water collection and filtration system, composting toilets, a 242-kilowatt solar rooftop, a solar-powered radiant heating system in its concrete floors, and 400-foot heat exchanger wells. The building acts as a living organism. It monitors light, carbon dioxide, indoor-outdoor temperatures and weather conditions – and then self-adjusts accordingly.